← Spain/Maggie Win the World Cup! Sometimes you have a crazy idea. Most of the time, if you even try to execute it, things just don’t fall into place. It almost never turns out the way you wanted it to. Yesterday was Limbo’s birthday. She was twelve. She’s the only one of our pets whose birthday is known, so we decided to celebrate. When we mentioned this to Abigail, she insisted that it was also Henry’s birthday. And when pressed, she determined that it was Maggie’s birthday as well. So the 12th of July is now official Animal Birthday in our house. Just look at the birthday joy on Limbo’s face. While a jaunty hat clearly does nothing to dim Henry’s enjoyment of food – any food – Limbo clearly needed a moment’s meditation on the occasion before digging in. It’s not every day that a cat turns 12. Since this was a birthday, that meant that cupcakes were in order. 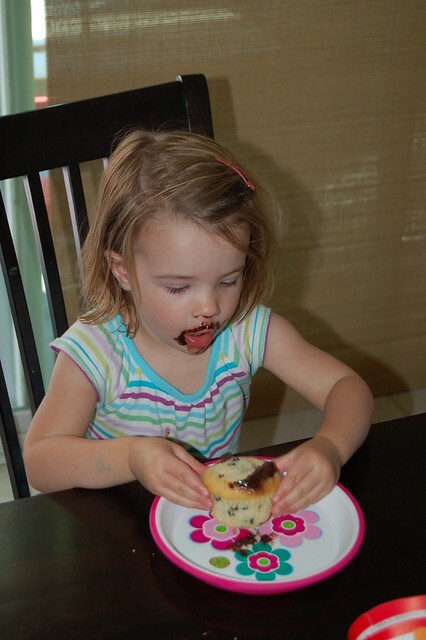 In her limited birthday experience, the association between this sort of event and cupcakes has been well established in her mind. We couldn’t disappoint that sort of expectation. Nor could we overlook an opportunity to take pictures of chocolate goatees. 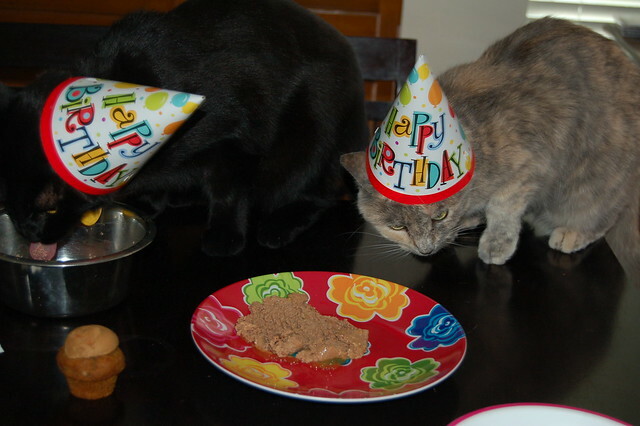 And since this is Animal Birthday, and not just Cat Birthday, Maggie needed to be included in the fun. She even got her own birthday cupcake. Maggie was also the one who objected to the hat the least. She has essentially become Abigail’s favorite toy, so things on her head are pretty much a given most days. Happy Birthday, Limbo, et al.! This entry was posted in Abigailia and tagged Cupcake, Henry, Limbo, Maggie. Bookmark the permalink. Abigail looks so big! She looks like a kid, not a baby, and I’m sure I don’t have to tell you this, but she is soooo cute! Is Chritsmas the next timew we will see you all? Unless you decide to make an impromptu visit. Visits, impromptu or otherwise, are welcome. 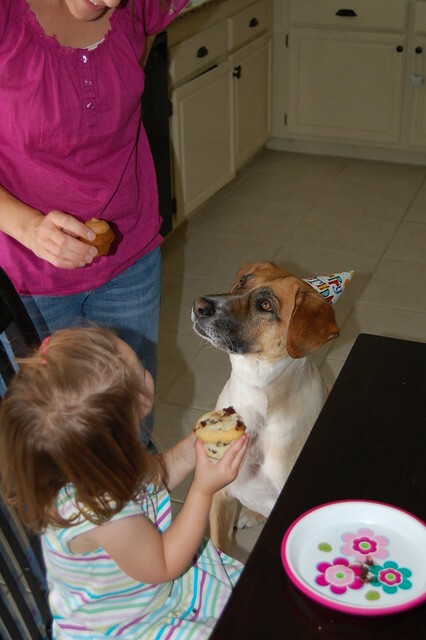 Hey, Maggie got a cupcake.